« Lost in the Blind Alleys of Arbil? This entry was posted on Friday, 30 July 2010 14:35 at 14:35	and is filed under Iraq's 2010 parliamentary election, Iraqi constitutional issues, US policy in Iraq: Leverage issues. You can follow any responses to this entry through the RSS 2.0 feed. Both comments and pings are currently closed. Excuse my naivety but I wanted to ask that, in the absence of a new government, who is actually running the country? Is it Al-Maliki and his lot who are doing pretty much what they were doing before the elections, or have the other groupings managed to exert some influence in the post-election period? Is it the case that things are merely being nudged along in this interim period, or has Al-Maliki been using his extra-time to implement any serious policies which would anger the others vying for power? Also, do you think any progress (from outside powers) in Iraq is contingent on the outcome of the STL in Lebanon, would be interesting to see if you draw any links between the two. The Maliki govt runs the country, with ministers from Daawa, ISCI, the Kurds, Tawafuq and independents. Some of these groups believe Maliki personally has grown too strong within the cabinet; others commend him for having taken strong action against militias and criminal forces. There is no doubt a relationship between the Saudi-Syrian struggle in Lebanon and the situation in Iraq at a very general level. If the Saudis and Syrians join together and manage to convince the Iranians to stop pressing for a single Shiite alliance and instead accept an Allawi government or a joint SLA/Iraqiyya one, then it would mean quite a seismic shift in regional politics. Excellent analysis as usual. Regarding the inactivity, besides waiting for the end of Ramadan, what else has to change to move things? Are there some key internal developments that are likely to move things, or is this process dead in the water until the outside actors (Iran, USA, Saudi Arabia, Syria, Turkey) have some major shifts in their policies and tactics? By the way, what is your take on syria and iran with respect to Iraq. In lebanon, Syria and Iran seem to support the same players. But in Iraq, Syria is pro-Allawi. Maliki has not been the most diplomatic with syria, but he did live there for some time. Why have the relations been so badly damaged? Mohammed, thanks, right now I believe Iraqiyya need to get to the point where they actually are faced with an INA-nominated counter-candidate to Allawi. Obviously at that point it could be too late, since Iran is pressuring SLA to rejoin INA – apparently if need be even if this would involve a Maliki premiership, as long as Shiite unity is maintained. As for Syria, if they are truly pro-Allawi then they would try to get Iran to accept an Allawi premiership or an Iraqiyya/SLA coalition. On the other hand, if some reports suggesting that they instead support Adel Abd al-Mahdi of INA, then I think this is an arrangement more on line with what Tehran prefers. Obviously psychology is playing a big role if not the biggest. The declared positions of the players must take note. I can’t imagine the US not worrying deeply of the outcome, their declared position may be their best effort to poker-face the situation! And the situation is simply an incumbant who does not want to acknowlege defeat, it is the responsibility of Maliki to defend the constitution to let Iraqyya start the first attempt, instead he did what Jaafary before him has done. Hani Ashor didn’t say in essence more than what Tareq Harb said. The international community may not owe Allawi a return to power but it is its responsibility to guarantee the census and transparency of the elections, especially before the planned census in October. بغداد/نينا/قال مستشار القائمة العراقية هاني عاشور ان جلسة البرلمان الاستثنائية يوم الاحد المقبل جاءت بطلب من اكثر من مائة نائب لتحديد وصف الحكومة الحالية بحكومة تصريف اعمال وانقاذ الدستور والبرلمان من التعطيل. واضاف في بيان صحفي اليوم :” ان من حق خمسين نائبا في البرلمان وفق ما ينص الدستور طلب عقد جلسة استثنائية لمجلس النواب لمناقشة القضايا المهمة ، ولان تأخر تشكيل الحكومة أصبح قضية مستعصية ، فان من حق النواب عقد جلسة استثنائية لكشف أسباب الأزمة الحالية ، وجعل الحكومة لتصريف الاعمال بعد ان أصبحت ممارستها لصلاحياتها معطلة للدستور ودور مجلس النواب التشريعي والرقابي “. وتابع :” جاء طلب عقد جلسة الاحد المقبل الاول من آب بتوقيع اكثر من مائة نائب ، وقد نص الدستور على ان (لخمسين عضواً من أعضاء المجلس ، دعوته إلى جلسة استثنائية ، ويكون الاجتماع مقتصراً على الموضوعات التي أوجبت الدعوة إليه) “. وأوضح عاشور :” ان الدستور ينص على ان حل مجلس النواب يحيل الحكومة الى حكومة تصريف اعمال ، وينص الدستور انه (عند حل مجلس النواب ، بإجراء انتخابات عامة في البلاد يعد مجلس الوزراء في هذه الحالة منحلاً ويواصل تصريف الأعمال اليومية ) وهو ما يعني ان عمر الحكومة الفعلي انتهى بقيام الانتخابات واعلان الفائزين في آذار الماضي ، وان الحكومة التي افرزها مجلس النواب السابق تعتبر منحلة بحله باعتباره هو المنتج للحكومة ، ولابد من انتخاب حكومة جديدة يختارها مجلس النواب الحالي وفي حال عدم الالتزام بذلك يعتبر الدستور معطلا بسبب هذا الخرق الكبير “. وشدد على :” ان الحكومة الحالية تتصرف حاليا بموازنة الدولة المالية رغم انتهاء صلاحيتها ، ورغم عدم مناقشة الموازنة السابقة ، والاعداد لموازنة العام المقبل ، ما يعني ان العراق سيدخل ازمة مالية خانقة ، اضافة الى اتخاذ قرارات مهمة في التعيين والاتفاقيات دون ان يقوم مجلس النواب بمراجعتها ، ما يعني تعطيلا للبرلمان والدستور الذي منح النواب تلك المهمات “. I would not worry a lot about the assumption that Iraqia may end up with only two weak ministries if the current impasse were to continue. This is because Iraqia will never join any government in which it does not have a leading role as per its constitutional right according to the elections results. In fact, it is more honorable for Iraqia to quit the whole political process than participating in a government of pseudo “entitlements” which you correctly called rubbish. My question to you is: do you think any government would be able to properly function in Iraq (with its current calamities) if the winning block with 91 seats abandon the whole political process. Surely, the issue is no longer related to achieving the simple majority of 163 seats only. It would be a mockery to assemble a coalition comprised of the self-appointed “king-makers” in order to circumvent the constitutional right of the winning list which is Iraqia, of course. Until this moment, Iraqia is the sole biggest bloc; so, it is actually a violation of the constitution that the President has not yet asked it to form the government. This is because he is (unconstitutionally) waiting for an illusionary coalition to materialize which incidentally serves his own political dogma without any due consideration to the impartiality of the post he is holding. It is extremely disturbing that the international community has not yet said a word on the consistent violation of this universally-agreed upon principle of democracy: that the winner should form the government. Iraq is not a banana republic and I hope the world would wake up before it is too late. Khalid, forming a government without Iraqiyya is constitutionally possible (either if you accept a loose reading of article 76 or if Iraqiyya is charged with forming the government and fails), but clearly not advisable, since no other party has any considerable support in the governorates where Iraqiyya are strongest, and since these areas – unlike Kurdistan – neither have nor want autonomy from the central government. You would end up with a government lacking support in many key areas under its direct responsibility. But I think it would be a miscalculation by Iraqiyya to imagine that others may not try to exclude them, or that in case such a thing happens that anyone in the international community would come to the rescue in a meaningful way. This is why I think it is dangerous to consider the question of ahaqiyya in a narrow sense, without contemplating the wider consequences. It worries me that some Iraqiyya figures and supporters, both in the media (I think Jamal al-Batikh) and on this bloc, have spoken about the idea of joining an oversized Abd al-Mahdi government – this is where I think the logic breaks down and they should compare with what they could get in a bilateral deal with Maliki. By the way, just a point of detail, it is not the duty of the current president/presidency council to charge the next premier. Until there is a new president, no one has this responsibility. What do you think of the chances of Iraqiya resorting to violence if they are not included in the government. This is something many of their leaders have either implicity or explicitly talked about in the past few months. Ali, I am really not in a position to answer that. It would be too speculative. I am focusing at the level of political negotiations and hope a solution can be found there – but I despair at the lack of realistic initiatives! This is a very realistic relflection on the political situation in Baghdad now. I bleieve that this deadlock was reached at by only one bloc, it’s the SLA. SLA chose to keep its taboo on Iraqiya in the first place before and after elections of last March. With the short-sighted vision, SLA gambled for the INA while they lost this bet once and INA proved to play for anyone else except SLA. By this silly decision, SLA created and actually presented a new and eventually the only one KINGMAKER to the Iraqi politics that led to maneuvers by initiating dialogues with SLA’s rivales and seeking support from regional actor, Syria and Saudi Arabia, that sends signals of dumping alMaliki. The idea that sparkles in everyone’s head now is to have an outside actor coming up with one candidate for premiership. This idea has come from the usual procedure Iraqi politicians are used to since 2003; they are used to having an outside actor who would push them to take action or nominate one for them and hence they only have to follow the rules and do it. 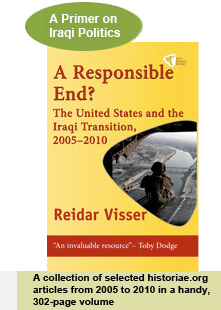 So, the UN or USA actors are expected by Iraqis or politicians to come up with a name; in this case Milkert or Biden are not far from the speculation to fulfil this scenario. 1) this is for the current problem: all the political blocs give up their candidates and come up with new names of figuers who can be tolerated and endorsed by all blocs for the premiership post. 2) this is for the long run: as politics in Iraq proved its tendency towards the one-man ruler and democracy still stumbles in its footsteps, a key amendment to the governing system in the constitution should take place. In this case, changing the system from premiership into presidential with retaining the parliament to do their legislative and monitoring role. As a result, people will decide who to be the President through elections of open-list option without leaving a chance to politicians to disrespect people’s votes. Ms. Bdairi, first apologies for the long delay in publishing your comment which appears to have got stuck in the spam filter at WordPress for no good reason. A couple of observations I’d like to make. Firstly, I am not convinced that SLA is only fighting for the all-Shiite “National Alliance”. Let’s look at this historically: SCIRI was in the 1980s an umbrella organisation created by Iran; Daawa, which had been incorporated into it, broke away because it did not particularly like the idea of Iranian dominance and the wilayat al-faqih concept and SCIRI became a political party. Many of the subsequent splits in the Daawa movement reflect Iranian attempts at recouping lost influence, often unsuccessfully. The UIA was created as the “second umbrella” in 2004; again, it was the Daawa – this time under Maliki – that broke away in 2008. The “third umbrella”, the INA, was created in Tehran in May 2009 when Ahmed Chalabi forged an alliance between the Sadrists and ISCI. Enormous pressure was put on Maliki to get him to join between May and October; in the end he refused. As late as in mid-March this year, Maliki was talking about a “political majority” in which he envisaged alliances with the Kurds, “parts of Iraqiyya” and “parts of INA”. Some of the people on his list, such as Izzat al-Shabandar and Haydar al-Jawrani have been talking in glowing terms about the prospect of an alliance with Iraqiyya, i.e. more than just tactics (Shabandar said it was a better alternative than the NA because the latter would cement Iranian dominance in Iraq). In sum, there is nothing that prevents SLA from resuming the dialogue with Iraqiyya. Indeed, I would go further than that. The Iraqi constitution contains so many checks and balances that it almost makes the country ungovernable. However, one majoritarian element remains, and it should be respected: The biggest bloc in parliament forms the government. When Iraqiyya and SLA, the two big winners, have the votes to form a single bloc, it would be disrespectful to voters to seek obscure compromise candidates for prime minister that no one has even heard of. Finally, I would discourage the idea of seeking changes to the constitution right now. Constitutional revision is clearly needed in Iraq, but doing constitutional revision and government formation at the same time is likely to be a messy kind of business. Did something new happen over the weekend, or are these the same events you have been reporting for some time. Jason, I see these as variations over the same familiar theme and think it is best not to get too engrossed in them: INA is pursuing different tactics to put pressure on Maliki in its bid for hegemony within the would-be Shiite alliance. If INA one day unequivocally declares its preparedness to accept Allawi as prime ministerial candidate – or if the projected Shiite alliance should be able to agree on a single candidate – then you would have a newsworthy item.